Diamonds Chicago is a wholesale diamond dealer on Chicago Jewelers Row in the Wabash Jewelers Mall and Jewelry Center Jewelry Mallers Building in Chicago Illinois. See us for wholesale diamond jewelry in the Chicago Diamond District. Click Here to search through our Certified Loose Diamond Database. We have over 60,000 Certified Loose Diamonds to Choose from. All are at wholesale to the public pricing. We also have approximately 50,000 diamonds that never even get posted to our site. Please call for the best pricing and availability. First, search through our certified loose diamonds and pick out your perfect diamond. Then go to the engagement rings page and pick out your perfect engagement ring semi mount! Diamonds Chicago has a huge selection of ladies diamond wedding rings and ladies wedding bands as well as the largest selection of mens wedding bands in the Chicagoland area. Would you like to buy diamonds at true wholesale prices? Now you can! 1) Buy Certified Loose Diamonds at their true wholesale prices direct from the importer. 2) Choose your perfect diamond from thousands of Certified diamonds or pick it right out of a parcel of many others just like the Jewelers do. 3) Then pick your setting. Whether you want a solitaire or a diamond semi-mount, you can choose from hundreds. We will set your diamond in the mounting of your choice and have it ready for you the same day in most cases. Buy Like The Jewelers Do. This is not an expensive showroom with fancy showcases full of overpriced jewelry. Fancy showroom's cost money and you are the one paying for it. This is a Wholesale Diamond Dealers Office. There is a desk with the appropriate viewing tools, a friendly diamond dealer and a safe. This is how the Professional Jewelers buy their diamonds. Now you can too. You will never have to pay retail again. Diamonds Chicago has hundreds of styles of Diamond Engagement Rings. We supply the diamonds to many manufacturers of fine diamond jewelry, so chances are if you have found a diamond ring you like, we either have it or we can get it for less. Diamonds Chicago is located In the heart of Downtown Chicago's Historic Diamond District. In the famous Jewelry Mall JEWELERS CENTER building. The Jewelry Mallers building is 13 Floors of nothing but jewelers. 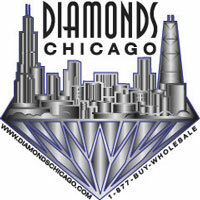 Most of the wholesalers will not sell to the public, but Diamonds Chicago does. There are two addresses to this building: 5 S. Wabash Ave. and 67 E. Madison St. This is the Premiere Diamond and Fine Jewelry Headquarters in Chicago. Diamonds Chicago is on the 13th Floor in Suite # 1308. One of the many services that we offer our customers is that we make appointments on evenings and weekends. During the day when all of the retailers are open, the typical customer would have to take precious time away from his or her work. This could cost you money. Diamond Chicago hours of operation are Mon-Fri 11am-6pm and Sat. 11-4pm. We can only meet with the public by appt only. Please call 1-312-422-0400 for an appt. Late weekday evenings and Sunday appointments are also available upon request. Customers wishing to visit us after hours will have to check in with security. Diamonds Chicago is a subsidiary company of Chicago Diamonds, Inc.
Diamonds Chicago is a wholesale diamond importer, diamond jewelry manufacturer, and dealer to the trade. Diamonds Chicago is Dedicated to providing high quality diamond jewelry at extremely competitive prices. Diamonds Chicago has a large customer base including independent jewelers and jewelry stores to big mall and chain stores. We also sell loose diamonds to a number of other diamond wholesalers and dealers. Diamonds Chicago is a full service diamond and diamond jewelry distributor with all shapes and sizes of loose diamonds in every cut, color, clarity and carat weight. Diamonds Chicago is a very aggressive company that is growing every day. Our customer base grows on a daily basis due to our aggressive pricing. We take the time to sit down and talk with our customers to find out exactly what diamonds will suit Their particular needs. We hope to serve you in the future. Call 1-312-422-0400 for your appointment.